Second only to Rome in the ancient world, Alexandria was home to many of late antiquity's most brilliant writers, philosophers, and theologians--among them Philo, Origen, Arius, Athanasius, Hypatia, Cyril, and John Philoponus. Now, in "Alexandria in Late Antiquity," Christopher Haas offers the first book to place these figures within the physical and social context of Alexandria's bustling urban milieu. Because of its clear demarcation of communal boundaries, Alexandria provides the modern historian with an ideal opportunity to probe the multicultural makeup of an ancient urban unit. Haas explores the broad avenues and back alleys of Alexandria's neighborhoods, its suburbs and waterfront, and aspects of material culture that underlay Alexandrian social and intellectual life. Organizing his discussion around the city's religious and ethnic blocs--Jews, pagans, and Christians--he details the fiercely competitive nature of Alexandrian social dynamics. 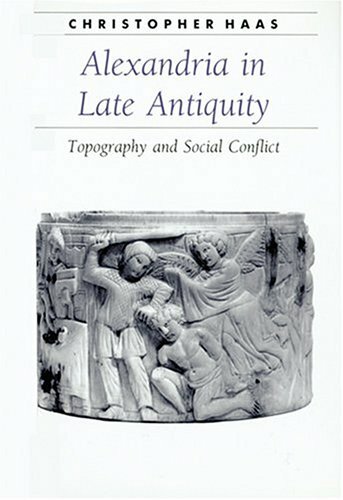 In contrast to recent scholarship, which cites Alexandria as a model for peaceful coexistence within a culturally diverse community, Haas finds that the diverse groups' struggles for social dominance and cultural hegemony often resulted in violence and bloodshed--a volatile situation frequently exacerbated by imperial intervention on one side or the other. Eventually, Haas concludes, Alexandrian society achieved a certain stability and reintegration--a process that resulted in the transformation of Alexandrian civic identity during the crucial centuries between antiquity and the Middle Ages.